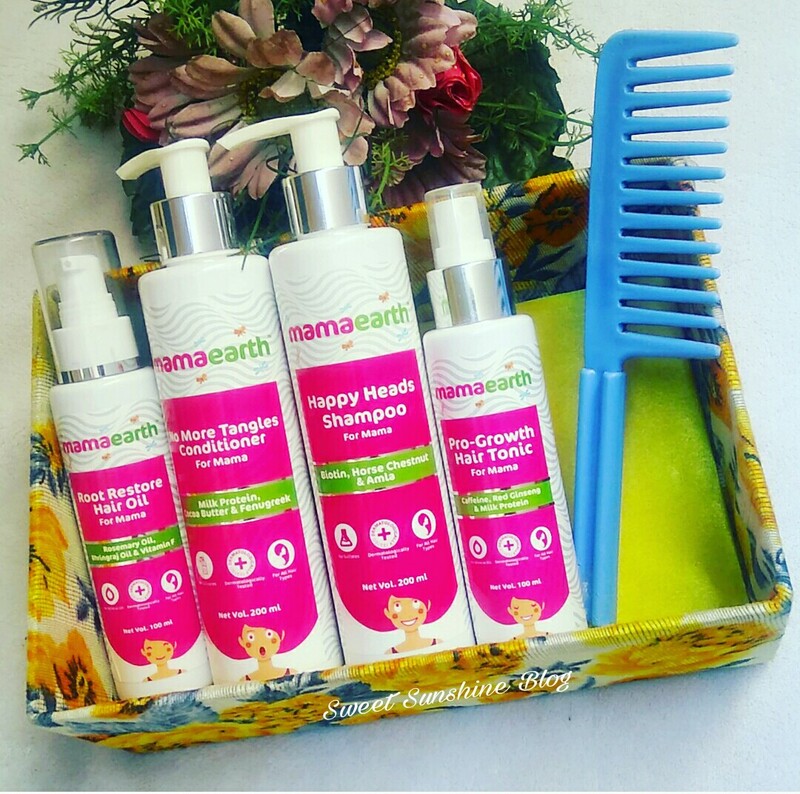 Review Of ” Anti Hairfall Kit” By Mama Earth !! Hair Doesn’t Make The WOMAN , but good hairs Definitely helps . Life is an endless struggle full of frustrations and challenges, but eventually you find a good hair care products you like..
& The Good Hair Care Products Featured Here are the Exclusive New Launch By Mama Earth India ! 4 Step Anti Hair Fall Kit ! It’s Made full of natural & organic bioactives which help promote hair fall control & hair regrowth. This Kit addresses the root cause of hair fall & breakage by Nourishing & strengthening hairs. Contains all hair friendly ingredients which work together & arrest the causes of hair fall. Follow this 4 step process from root to tip, to ensure that it will fix all our hair issues. I Personally Used All the four products twice , I’m already impressed with the results. Though it’s a 6 weeks Challenge to follow For Smooth, soft, manageable and Lustrous Hairs . I really can’t wait to use them Regularly , To notice the difference . I’m Sure these Promising hair care products will never fails me to impress. So Let’s Talk About the complete 4 Step range one by one .. This Hair Oil Is Made with the powerful combination of all most efficacious natural Oils. Such as Coconut oil, almond oil, olive oil, orange Oil, rosemary oil, jojoba oil, etc. It Nourishes Your scalp & hair from root to tip. It helps in strengthening our hair’s , reduces hair fall & gives a Lustrous sheen to the hairs. Apply Oil on the scalp. Massage the scalp gently in a circular motion using your fingertips so that the oil is absorbed into the scalp. Leave for 30 mins. or more before washing. Priced at Rs. 399/- for 100ml. Loaded with the goodness of Biotin, horse chestnut, bhingraj & Alma , this shampoo makes your hair’s well nourished & make them thick . It’s Gentley formula , cleanse the hairs properly and even helps in removing the built up residue from scalp. Gently massage shampoo into wet hair and scalp with fingertips to work into a lather. Leave in for 2 minutes to allow for deep penetration and full absorption. Rinse thoroughly. Priced at Rs. 340/- for 200ml. This Gentle Hair Conditioner Contains milk protein, Cocoa butter & fenugreek which makes our soft and silky . This conditioner is not at all thick in nature (absorbs into the hairs so quickly) unlike other hair conditioners available in market . This conditioner not only detangles hair, but also moisturizes dry strands. It’s Key Ingredients : Cocoa Butter, Shea Butter, Amla Extract, Fenugreek Extract, Tea Tree Oil . After shampoo, take adequate quantity of Conditioner. Apply it on your hair starting from the root and all the way down to the tips. Leave for 2-3 minutes. Rinse thoroughly. For enhanced results. Wrap your hair in a towel or shower cap after applying the Conditioner & keep it for 10-15 mins. Rinse thoroughly with running water. It’s light and non – greasy in nature, which promotes healthy scalp and gives soft, glossy hair within seconds of application. It contains Caffeine,Korean red ginseng & Milk protein which Strengthens hair roots, reduces hair fall & improves hair density. Apply directly onto scalp, daily. Use enough to dampen scalp and gently massage into scalp with fingertips. Results may occur within 6 weeks with daily use. Priced at Rs. 499/- for 100ml. Some Good News for You all. The Total Overall Kit Is Worth Rs. 1596/- . But You can Buy this Only at Rs.999/+ as the Introductory Offer is going on Currently. This is a Great deal ,isn’t it ?? I must say all products are worth buying For The Good Hair Days to flaunt ..
P.s. – This Kit is Suitable For All Hair types & Is Dermatologically Tested . Mama Earth is the only Made Safe Certified Brand In Asia Made by a Parents (Ghazal & Varun) for the parents !! When they decided to do something different for their baby , they create products which were completely safe & certified toxin free. A brand which develops products from world class research and attempts to solve every little problem that we as parents face. With the aim of making products which are mum-baby friendly, toxin-free, meet stringent international standards & are basically ultra awesome, MamaEarth was born. I Personally Find All Mama Earth products a perfect boon for myself & my kids . Mama earth never fails to impress me & this time they Rock The Party As well. After its all about The Gorgeous Good Hair Days .. So A ⭐⭐⭐⭐⭐ 5 Star Rating from Myside. I loved The Entire things about these Mama Earth products the packaging, the better results , it’s easy availability, etc etc. After all Our Hair’s Is 90% Of Our Stunning Selfie .. ?? That’s Why I Loved These products & would highly recommend this to everyone for Our Gorgeous Hair’s !! After All our hair’s are Our biggest assets !! N it’s From My Favourite brand off course !! ⭐⭐??? &&& It Smells Amazingly Awesome Which is Like A Cherry on the top !! So Guys & Gals Grab your pack Like Now ??? Visit the website & find the Awesome Range of Mama Earth products For Yourself And Your Baby & Feel the difference & quality of the toxin free products , unlike other brands !! I Highly Recommend These Products To All My Beautiful female tribe for themselves & their little ones , so that they should deserve the much needed pampering !! P.P.S : Your Better Half can also do some indulgence by enjoying These effective hair care products .. ?? & order some Mama Earth stuff for you & your kids & Enjoy Your Motherhood Like Never before !! N Share Share Share As ” Sharing Is Caring ”?? Have A Joyful weekend ahead !! Main bhi isi brand per switch karne ka soch rahi hu, bas pehle wale sab stock khatam ho jaye ? Kitna accha detailed review hai ?? MAmaearth is everywhere..i am so happy seeing the way this brand is growing, amazing products and good customer insight!!! Mamaearth products are always worth to buy. This kit is amazing for hair problems. This looks very effective anti hairfall kit. I love products from Mamaearth. This kit is like a blessing to us. Its natural and easy to follow. My hair felt good juat after first use. This is a very useful and effective anti hair fall kit. I love using it too. Very well reviewed! These days mamaearth doing great. I’ve also very good experience with their baby and moms care range. Yet to try this kit. I’m also using the kit. And is very much impressed. I have been using the antihairfall products for a while now by Mamaearth. And I loved the way it cleans the hair and maintains the natural texture. Very nicely written review this is.